To advance gender equity for women and girls through research, education, and advocacy. 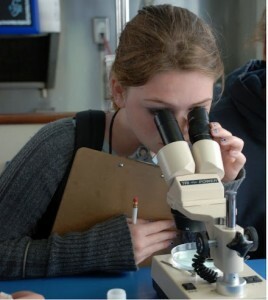 Since 1998 AAUW Tech Trek camps have been designed to encourage girls in middle school to maintain and grow their interest in STEM. Studies show that girls’ interest in science drops in middle school, but can be sustained if they are exposed to experiences and role models in STEM careers. In fact, Tech Trek alumnae go on to surpass the national average in most advanced math and science courses. Started as an AAUW-California Community Action Project, today Tech Trek is a national AAUW program with summer camps held at 22 different sites around the country. Girls are nominated by their math and science teachers and selected by a committee of AAUW members. For information on future Tech Trek camps go to https://www.aauw.org/what-we-do/stem-education/tech-trek/ (live link to camp schedules). Tech Trek has always and will forever be one of the greatest and most memorable weeks for me. This has opened my eyes to many new and different careers that I had never heard of before. I was able to learn so much and learned completely new things. I never knew that there were so many things that I can do as a woman to change the world. You have truly changed my life. During the time that I’ve spent at this camp with my fellow campers, I have become a more independent and confident girl. Volunteer to interview Tech Trek applicants, and/or to be a dorm mom at Curie Camp at Stanford University, contact us at techtrek@aauwsanjose.org. Donate to the Tech Trek fund at AAUW San Jose by writing a check to ISPF-AAUW of Santa Clara Co. (SCC) and write Tech Trek in the memo line. Mail to AAUW San Jose, 1165 Minnesota Ave., San Jose, CA 95126.